Thomas Starr King was born in the city of New York, December 17, 1824. His parents were Thomas Farrington King, a Universalist minister, and Susan Starr, both of New York. After short pastorates in Norwalk, Connecticuit, Hudson, New York, and Portsmouth, New Hampshire, Mr. King’s father was settled over the Universalist church at Charlestown, Massachusetts, in 1835, where he remained until his death in September, 1838. Meantime the boy went to the public schools, preparing for college. Of a singular purity and integrity of character, and moved from his early years by deep religious emotion, he longed to fit himself for the ministry, and to give his life to the service of the church. These aspirations received a rude check when the long sickness and death of his father brought the family into financial straits; and Starr, as the oldest of the six children, was called upon, though still a mere boy, to help his mother in maintaining the family. His school-days came to an untimely close, and he obtained employment in a dry-goods store. A year or two later he was made assistant teacher in the Bunker Hill Grammar School; and in 1842, when not quite eighteen years of age, he became principal of the West Medford Grammar School. He soon resigned this position to accept a desk in the naval storekeeper’s office at Charlestown, where he had a larger salary to contribute to the family, and more leisure for reading. Guided by experienced friends, he worked out for himself a thorough course of study, and pursued it in his leisure hours, with an indomitable patience and determination, till he had mastered substantially the requirements for entrance to the ministry. His studies may have been irregular, but his acquirements were not superficial. His peculiar circumstances, winning personality, and intense earnestness had drawn to him such friends as fall to the lot of few young men; and he could reckon on the sympathy and advice in his studies of such men as Hosea Ballou, E. H. Chapin, and James Walker. 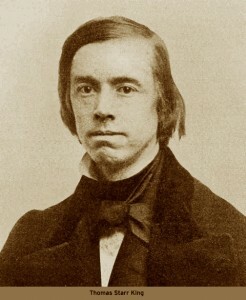 Few theological students at graduation are more thoroughly equipped for their vocation than was Mr. King when he preached his first sermon at Woburn, Massachusetts, in October, 1845. The dividing barriers between the Universalist and Unitarian bodies were slight; and, when he was installed over the Hollis Street Church on December 6, 1848, Dr. Ballou and Dr. Chapin participated in the services with Dr. Dewey, Dr. Frothingham, Mr. Bartol, and Mr. Alger. Mr. King openly adopted the Unitarian fellowship, although his relations with his Universalist associates continued to be of the most friendly character. The first work that lay before him at this new departure was the building up of the Hollis Street parish. Torn asunder by dissensions, it had diminished in numbers and strength till many doubted whether it could survive. Mr. King himself afterward said that, “had he known the precise state of the case, he would not have dared so great a venture as an acceptance of the call.” The result justified the wisdom of the people in calling him to their pulpit. The attendance rapidly increased. New blood came into the church; and during the eleven years of his pastorate it constantly improved in strength and permanence, as its pastor gained a deeper and deeper hold on the affections of his parishioners, and at the same time grew in power, influence, and distinction with the public. The sources of his success are not hard to trace. Back of all his brilliancy as a writer and his eloquence as a preacher was the man. The preacher was admired, but the man was loved. Nature had given him a character of exceptional purity and uprightness, so that the temptations that lie in wait for young men seemed to have had no attraction for him. With a vivid imagination, which looked at the world from its ideal side, his religious faith had no misgivings, the spiritual world was more real than the visible universe, and God was always with him, his friend and comforter. His heart was overflowing with sympathy and pity for the suffering and distressed. He was always ready to give his time and energy to help others, and in his generosity he never spared himself where he could bring relief. Little wonder, then, that he captured the hearts of his people, who loved him for his week-day ministrations even more than for his Sunday preaching. But the great public was drawn to him by the brilliancy and lofty aim of his discourses, whether in the pulpit or on the lecture platform. He was a keen observer and an omnivorous reader. Whatever he read or saw was stored up in an orderly mind, ready to be drawn upon for illustration of the subject in hand, and, whatever the topic, it presented itself to him on its spiritual side as the thought of God expressed in the world of things. He reveled in the beauties of nature, and delighted to spend his vacations either on the seashore or in the mountains; but the restless sea, the solitary mountain peak, and the solemn music of the pines, all equally suggested the majesty and love of the Creator. He kept pace with the latest discoveries of physical science; but, whether it was the telescope piercing the illimitable depths of the over-arching heavens or the microscope peering into atomic mysteries, the subtleties of chemistry, or the wonders of geology, each was a testimony to the great Law-giver who arranged their harmonies. Nature in every form was full of divine life; but it was in human life, above all, that he saw the expression of the power and goodness of God. The beauties of art and the steady progress of man in history were freely used as illustrations of the guiding hand of Providence. Every individual man was the child of God with infinite possibilities, and Mr. King sought to win him over to goodness rather by displaying the beauty of holiness than by the fear of punishment. He dwelt on the misery of sin, the wretchedness of the man who shut himself out from the light of God, as though one should live in fog and darkness rather than under the light and warmth of the blessed sun. His preaching, in short, was positive, and optimistic. The period of his residence in Boston was one of sharp theological combats, but Mr. King took little part in them. This abstinence did not indicate a lack of courage. His undaunted crusade in California proved that. In the struggle for the life of the nation he knew no fear, and his blows were sledgehammer. His kind heart, however, made controversy distasteful, while the fairness of his mind bred in him the habit of looking for the strong side of his adversary’s position. His religion was most practical. Do good, and it will disclose to you the secret of happiness. Give your money, give your time, give yourself, and the satisfaction of giving will reward you. “People should be educated to giving,” he said, “just as they are educated to everything else”; and certainly he carried out his doctrine by educating the people of California to give to the soldiers. In his daily life he practiced it himself, giving freely of his money, his time, himself, to every good work, to his friends, to all who called on him. But a much larger public admired him as a lecturer. The lecture fashion was then in full vogue, and the most eminent men were found on the platform. Men of national fame, like Emerson, Wendell Phillips, and Holmes, made their lecturing rounds every winter; but nobody was more eagerly sought for than Mr. King. His lectures were of the same tone as his sermons. Almost all of them, in one form or another, insisted on the superiority of ideas to sensual perceptions: they were sermons in disguise. His tours covered the principal cities in the Northern States, from the Atlantic to the Mississippi, and at great cost to his physical strength; for traveling in those days was not the easy thing it is today, and it taxed his vital powers severely. On December 17, 1848, shortly after his installation, he married Miss Julia M. Wiggin, of East Boston; and he gathered around his hospitable fireside a group of bright young men, whose names have now become historic. Mr. King’s fireside talk was as agreeable as his public addresses. Genial in temper, overflowing with wit and humor, he will always be remembered by those who knew him well as a most charming companion. This influence was not confined to his household, but pervaded his whole life; and, wherever he went, high and low, rich and poor, scholars and unlettered men, were equally drawn to him by his cheerful temper and bright conversation. Up to the spring of 1859 Mr. King’s life seemed a success brilliant enough to satisfy any reasonable ambition; but, in the providence of God, it proved to be only the training for a freer action in a wider field, with grander results. There were other cities besides Boston that wanted his services in the pulpit. In the fall of 1859 he received invitations from Chicago, Cincinnati, Brooklyn, and San Francisco; and the last prevailed. The Hollis Street Society, being reluctant to part with him entirely, gave him a leave of absence for fifteen months; and he sailed from New York on the 5th of April, 1860, via Panama. At San Francisco Mr. King met very much the same conditions as he found at Hollis Street eleven years before—a moribund church, a depleted society, with an insufficient income and a heavy debt. He landed in San Francisco on Saturday, April 28, and announced his intention to preach the next day, although no preparation had been made for a service. The result was surprising. On this short notice the church was crowded to its utmost capacity, nor did the interest evaporate as the idle curiosity of a day. The vacant pews were soon all taken, the empty seats were filled, the income rose to a figure before unequalled; and, when his first year closed, the debt was paid, and the church was on a solid basis, the strongest Protestant parish in the city. Nor was the pulpit his only avenue of influence. From the day of his arrival he was in constant demand for the lecture platform. Invitations poured in from all the large towns of California, and soon his name became almost as familiar on the Pacific coast as in New England. Such was the character of his first year’s work, to fill the church, to pay the debt, and to knit the parish together into a strong organization, loyal to him, buoyant with hope, and elastic with conscious strength. His second year brought service of a very different character, whose results reached far beyond his church, and gave him national fame. At the beginning of the Civil War the position of California was uncertain. Among its citizens was a large body of men from the slave States, powerful in wealth and social position, who ruled the politics of the coast. The governor of the State refused to preside at a Union mass meeting. Besides these open enemies there were many Union men who shrank from the prospect of impending civil war, and to them a disloyal press held out the bait of a Pacific republic. The defection of the Pacific coast at that day of peril might have been fatal to the national cause. Mr. King had promised to stay in California a year. He now felt that his life was worth more there than in Boston, his opportunity for service was greater. The loyalty of California was doubtful, and she must be won over at any price. He dissolved his connection with the Hollis Street Church finally, and entered on his crusade for the Union. With the secession of the Cotton States in February, he began his campaign by lecturing and preaching on subjects intended to warm the love of country in the hearts of the people. After the fall of Sumter he announced his position to his congregation in a stirring sermon on their practical duties. To his great joy his people responded eagerly to his call. The flag was raised over the church; and Mr. King, during the summer, canvassed the State, from end to end, in an earnest fight against secession. The story of that campaign would be interesting reading. It took plenty of courage and endurance. The secessionists felt the might of his blows, and spared no means to drive him from the field, even threatening his life. But nothing could swerve him from his purpose; and when, in the fall election, the loyalty of the State was settled by an overwhelming majority, the people of California felt that no one force had done so much to save the State as Mr. King. The loyalty of the State being settled, his restless energy sought for some other outlet in the service of the country; and he entered into the movement for the sick and wounded soldiers with his usual force, canvassing California and the whole Northwestern coast as far as Vancouver’s Island for the Sanitary Commission. And a million and a half dollars flowed into its treasury from the Pacific coast. This work occupied the summer of 1862. Meantime the need of a new building was pressing hard upon his people. Mr. King headed the movement with a subscription of a thousand dollars, and offered besides to give the new church an organ. His people responded to his appeal, and on December 3, 1862, the cornerstone of a new edifice was laid. The following year he took great delight in superintending its construction, studying every detail with loving care. In addition to these and his many other duties he had planned another campaign up and down the coast for the Sanitary Commission, but his feeble health forbade such exhausting labor. Mr. King was frail in body when he left Boston, and his work in California would have taxed the strongest constitution. His spiritual energy and indomitable will carried him through a stress that was really far beyond his physical strength. At last his overtaxed powers gave way; and, when acute disease attacked him, he was powerless to resist it. He had the satisfaction of seeing the beautiful church completed and dedicated on January 10, 1864. He had preached in it seven Sundays, including the dedication, when he was attacked by a fatal disease, and passed away on Friday, March 4, 1864. His death was mourned as a public calamity; and on the following Sunday, the day of his funeral, the city was draped in black, flags were at half-mast, and minute guns were fired from the United States forts by order of President Lincoln, in recognition of his service to the country. He gave his life for the nation. The citizens of San Francisco erected his statue in Golden Gate Park; and every year, on Memorial Day, it is crowned with flowers in token of his sacrifice. He died at the early age of thirty-nine, at the zenith of his usefulness. His career had been one steady increase of power and influence from his first entrance into public life. His life had covered a remarkable range of activity, but the same electric force pervaded it all. The high enthusiasm and devotion to his ideals gave him power on the platform, in the church, and in the rough stump-speaking of his patriotic campaigns, and made him singularly successful in whatever he undertook. His works live after him, and he is remembered on the Atlantic and on the Pacific equally with affectionate gratitude. Mr. King left a widow and two children.